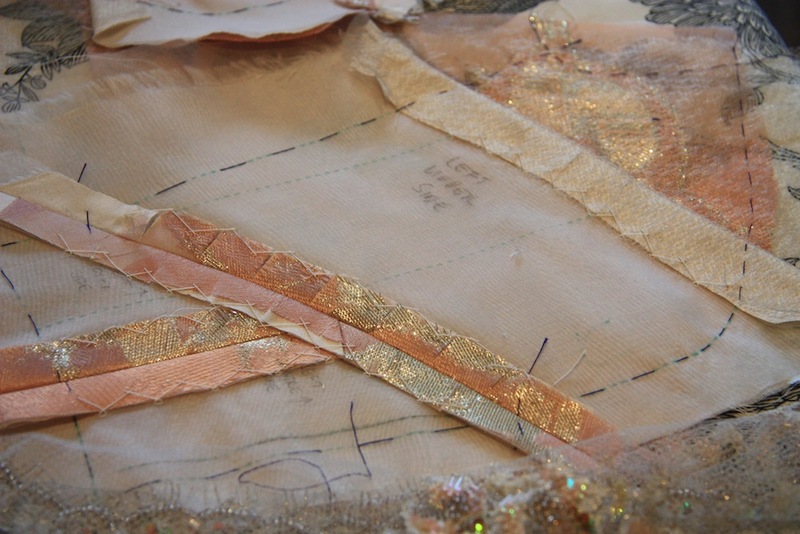 The final and most complex part in my 3-post series on constructing my wedding dress! I used Marfy S963 for the bodice of my dress, which I thought was very elegant – a bateau neckline at the front, deep V-neck at the back and a capped seam that curved down around my shoulder somewhat. The front design is pretty special – with princess seams across the bust which join with two darts to create shaping at the waist. As I was only interested in the top half of this pattern, I also added in a waist seam once I’d muslined it. I think this dress would translate incredibly well into a sheath dress suitable for work also, once you remove the rear flounce and raise that deep V in the back to account for hiding your bra. But then when skimming through some dress inspiration pictures saved on my computer (pre Pinterest!) I saw this – look how well it would work for a dressy dress too! 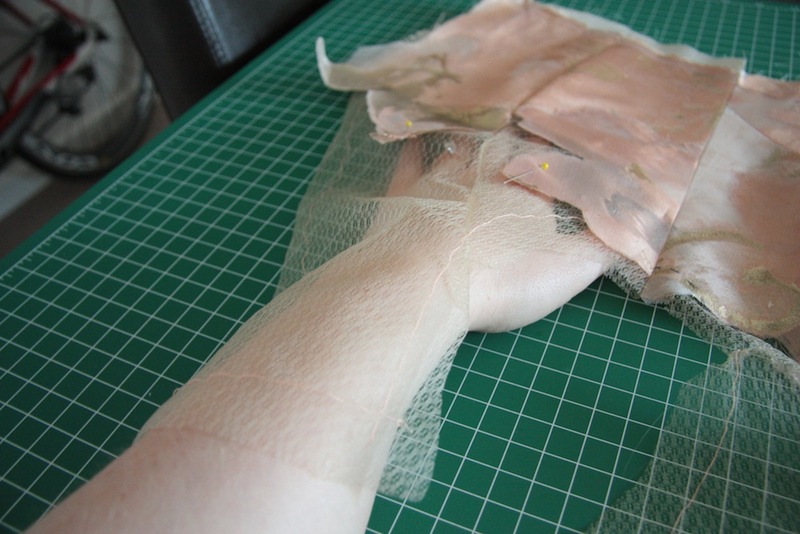 As for the muslin – after all the pain of sewing and fitting my bustier, this was a dream in comparison. I distinctly remember wiggling into my first version of this, hardly able to wipe the grin off my face because it was so DAMN GOOD. The bodice barely needed any adjustments other than a dart-be-gone at the back to remove some very minor gaping, extending the front princess seam a little closer towards my arm (standard adjustment for the broad shouldered) and moving the waistline down the same 3.2cm (1 1/4 inch) as I did to the bustier pattern. The muslin was easy and came together in a flash. The real thing? Not so much! I sewed up the back and side pieces first – which is when I realised that any kind of normal thread against the souffle would stand out like a burnt pixel on an LCD screen – kind of ruining the sheer effect! A trip to Spotlight later and I had some ‘invisible’ thread – basically a very fine fishing line. This thread was about a third of the thickness of your regular gutermann poly thread, and incredibly difficult to work with… because you can’t bloody well see it. Also, it curls up worse than cotton thread after being under tension, and very easily snarls itself up – working with small lengths of this ‘thread’ when hand sewing was a must. I went cross-eyed every time I had to thread a needle with it, and quickly realised that sewing it would have to be relegated to daylight hours only. I sewed the souffle seams together with the invisible thread on the machine (it handles fine as long as you go slowly, otherwise you’re dealing with too much plastic on plastic friction and it gets stuck on the machine’s spool holder, ruining your tension). I then cut back the seam allowances to 1cm and used the (hand sewn) rolled hem technique to seal everything up. It looked quite pretty I thought! 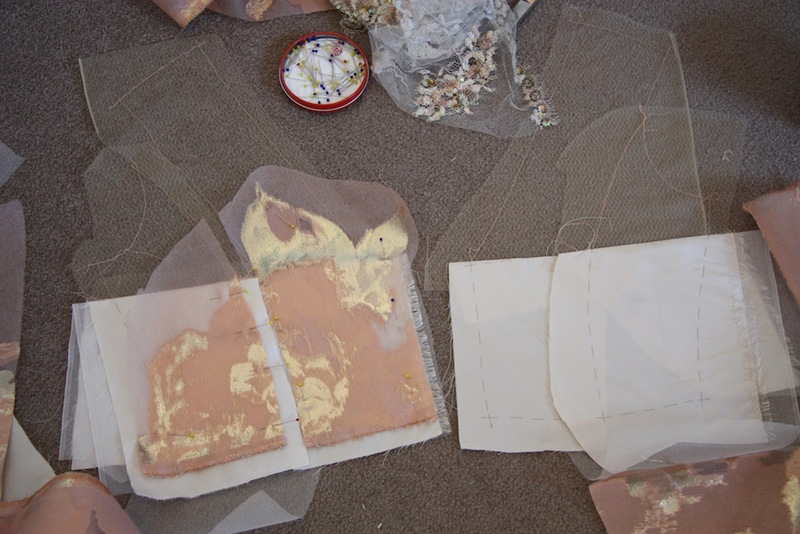 You can see in the photos above that the organza overlay was initially separate to the souffle – once I’d got the bodice sewn together, I focused on joining these two layers. I cut away the sheer part of the organza from around the floral shapes – there was of course a small amount of fraying but I liked the way this softened the cut lines. Initially I thought I’d use a pick stitch, but the invisible thread doesn’t work so well in angles. 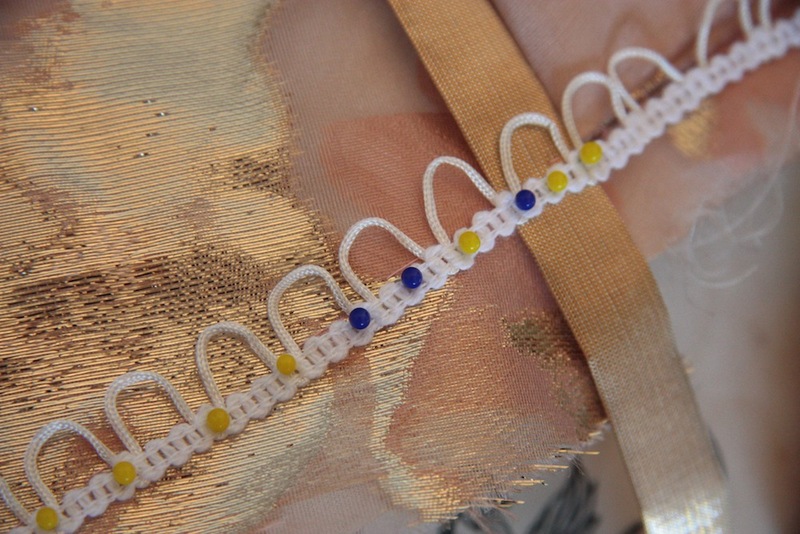 What did work was a (pretty haphazard) loose running stitch – there’s actually a lot of thread sitting on top of the organza overlay – but you can even feel in when you run your fingers over it, let alone see it. The original inspiration dress (an indeed many of the dresses from that particular collection) had a metal belt with a matching leather buckle at the back of the dress – the metal part tying in beautifully with the gold of the fabric. I used a 1.5cm wide strip of horsehair canvas and covered it in the dupion, using a fell stitch on the wrong side to enclose the canvas. I chose the size based purely on the size of the buttons at the back so it would all tie in nicely. I sewed this directly to the bodice along the waist seam line, leaving the top un-sewn to encourage the illusion of it being separate. The perfectly matching gold ‘belt’. And one little spot where my organza placement didn’t quite cover the piece. The result of piecing with scrap! This later got an applique and lace over the top to hide it! There was one little spot on my dress where I just didn’t have scraps big enough to cover the entire piece… I was originally going to then applique stitch a cut piece of fabric over it, but in the end decided not to (it looked wrong). From that little imperfection I was bizarrely reminded of my visits to several notable Mosques – Hagia Sofia in Istanbul and pretty much every Mosque in Iran – and the incredible relief artwork and mosaic tiles. The artists have been said to intentionally make mistakes in their intricate geometric patterns – an interesting article about that here. As an imperfect being, I rather like the parallel. And even though there are small errors – the overall effect is still strikingly beautiful. Indulge me with the particular holiday snap that inspired this? 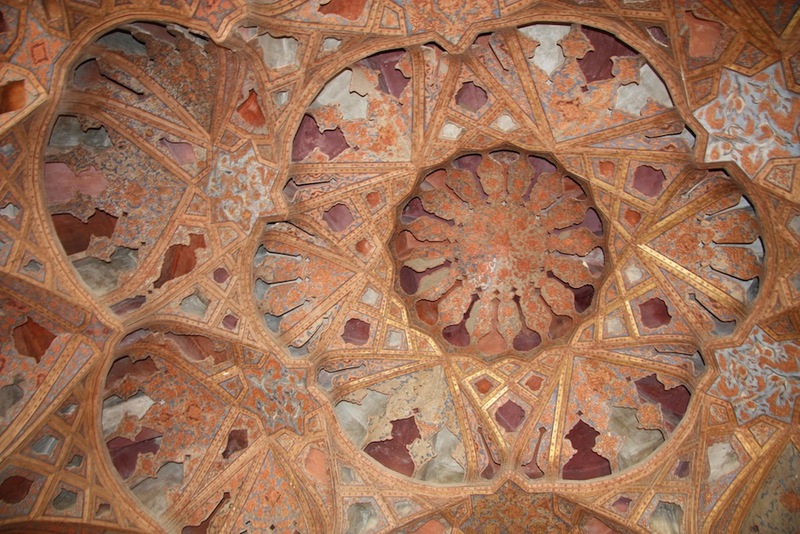 The ceiling of the music room, at AliQapu Palace, Imam Square in Esfahan, Iran. As I’d already cutout my fabric and sewn the pieces together at the time of seeing the above picture, my facing wasn’t quite as wide as I’d perhaps prefer it to be. 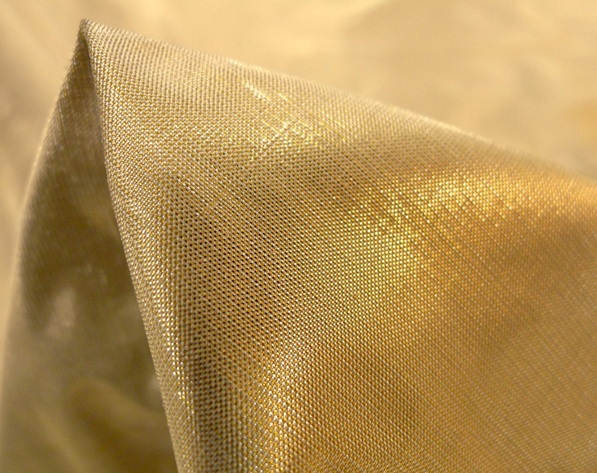 Of course, it also recommends to do this in Susan Khalje’s Bridal Couture book, as otherwise when placed under tension the two fabric edges would be likely to gape. I’m sure I had read over this paragraph (it’s on page 40) multiple times before seeing the picture above and having it click into place though… definitely a visual learner! From Susan Khalje’s online shop I bought a strip of rouleau loops – no way was I going to make this myself if a ready made option was already available! The cord was white though – and I was planning to attempt dying it. That wasn’t something I ended up getting around to though, which I’m a bit sad about. You can’t see a huge amount of white, but it’s still there to be seen if you’re looking. I was running out of steam… and time! 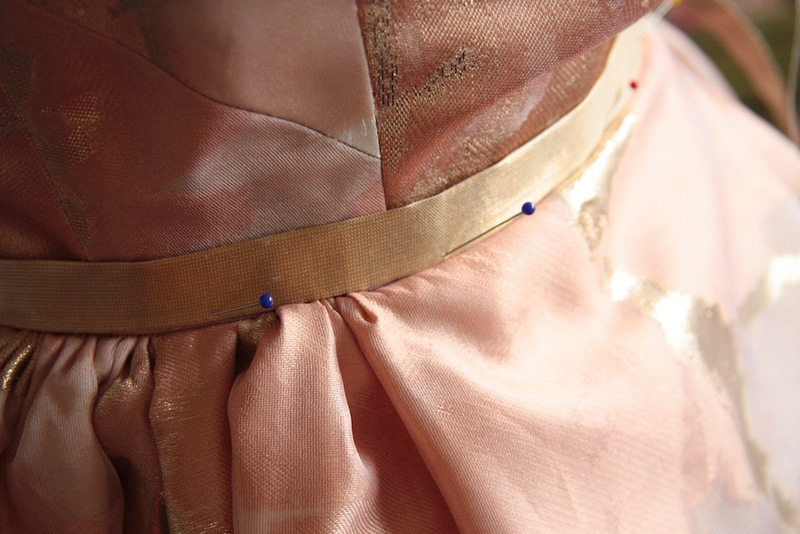 The final button at the waist was in the gold dupion to match the fabric belt. This is where I REALLY started getting excited! I couldn’t wait to get home every night from work so I could sew more on :) I did have a moment of wondering if the lace was even really necessary because it was so lovely just on its own… but nah. Well. The lace – which I’m told was made specifically to match the organza – was a super gorgeous embellished chantilly with a giant border repeat on one side, and a tiny repeat at the other selvedge. In between was paisley shaped teardrops of the same. I decided fairly early on to use the tiny selvedge repeat down the V-neck at the back – it would be light enough to be supported by the souffle and in turn provide some stability along the bias edge. This was the first lace I applied, using the invisible thread (ugh, nightmare). 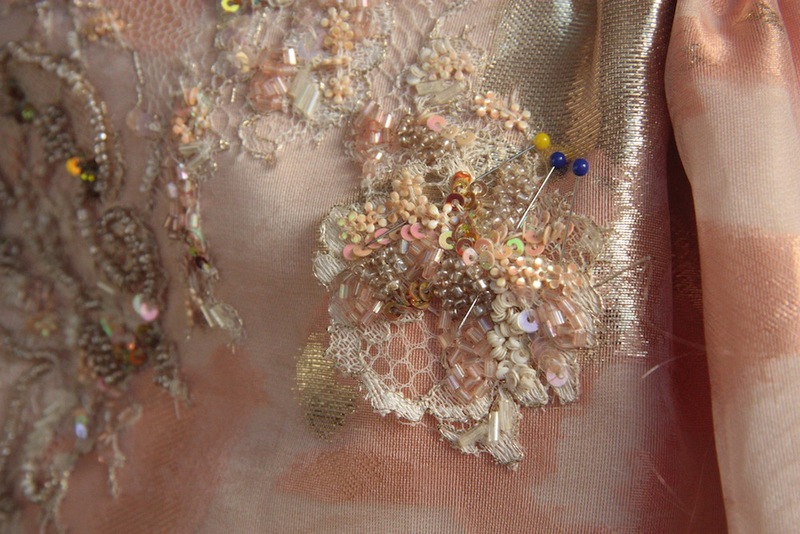 The rest of the lace was cut and appliquéd across the bodice and down onto the skirt. 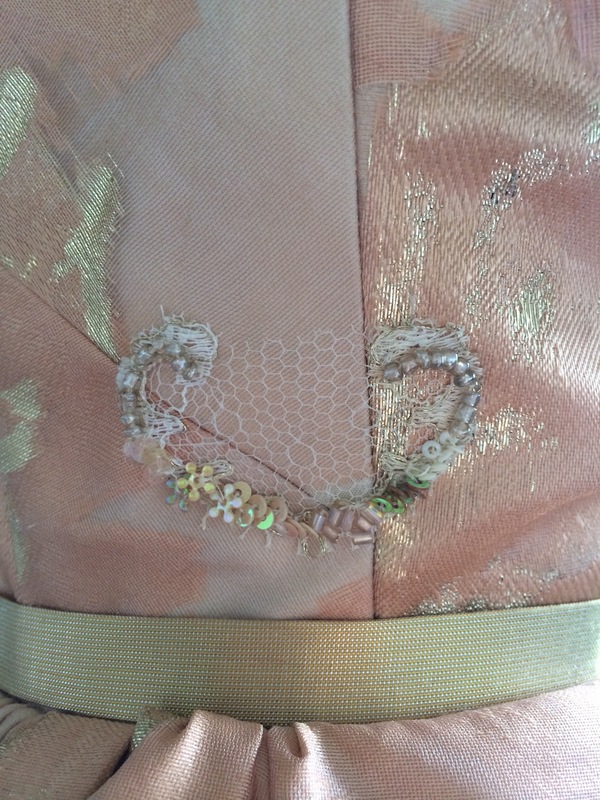 The shapes I cut were dependant on the lace design to some extent – in the photo below are two repeats with the bottom one turned upside down so they ‘connected’ with the same beads at the centre. The lace on the skirt is a different part of the repeat, with a few smaller shapes that I could easily cut out (without having beads going flying off in every direction) to try and make the placement look a little more organic. I had a yard of this lace… and I didn’t even use a quarter of it, if you discount the fact that I used virtually the entire small selvedge along the back line. 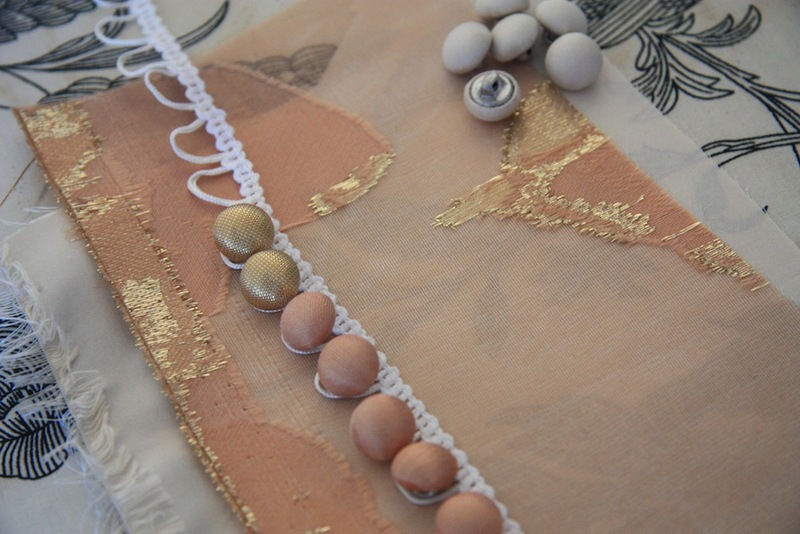 When using lace as applique – it becomes an incredibly economic fabric to sew from. You need a lot less than you think you do! Once I’d secured the edges to the fabric and finished hand sewing it down, the netting was cut off. I started on the bodice and worked my way down the skirt. I sewed this on over the course of a week, again due to working with the ‘invisible’ thread it was only able to be done during daylight hours. I’d purposely cut the front skirt panel to have a big floral motif closer to the hem and a bit of empty space at the waist, which I thought at the time would do well for lace placement. The original inspiration gown had lace ‘tumbling’ down one side of the gown front, so I imitated that. How natural light makes a difference to the colours! 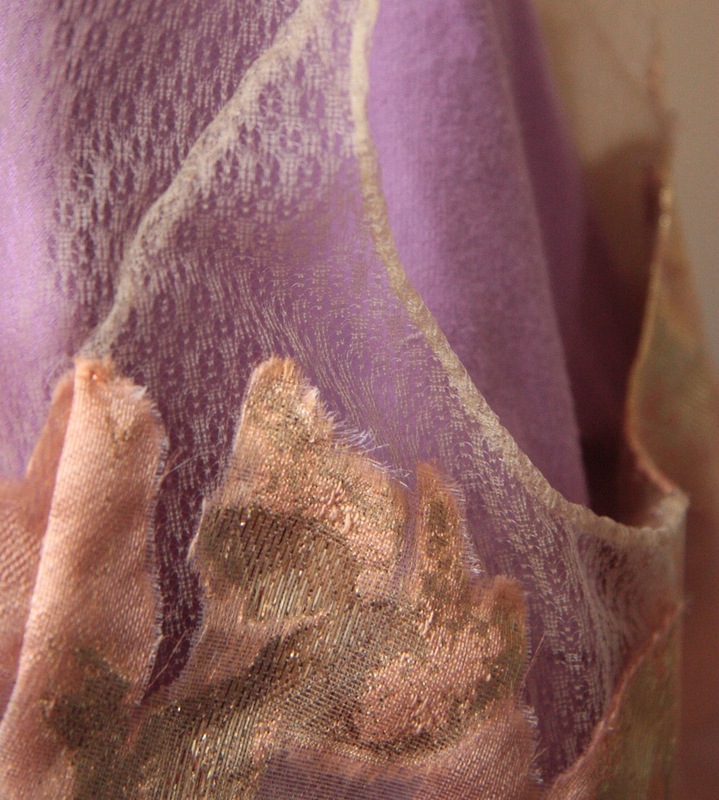 This is probably the most true colour representation of the fabrics and lace in this post. Quite a few. Namely, the taffeta was very challenging to work with. Just because you test a garment by making a muslin, doesn’t mean it will turn out that way – because fabric hand can change everything. And that’s the pooching of the bodice under my bust. I have two theories – the first being that I had the position of the very-snug waist stay not quite in the right position – this was up against the bustier so wouldn’t have been able to move once done up and incorrectly positioned. The other theory is that it’s the taffeta = 1, my sewing skills = 0. Perhaps it’s a combination of both. It’s all been parked for things to take into consideration should I ever work with silk taffeta again. And that, my pretties – is it. Well, mostly. I also made two other dresses… coming up next! Your dress is just stunning. I started sewing a while after I married my husband and could not imagine being able to execute such a beautiful vision. I so think the further we move from an event, the less details play on your mind. I felt terrible at my wedding because I forgot to pose for photos with the annuals my step dad had planted for that purpose and I wished I had picked prettier shoes. But when I look back, all I see are happy people that I love in happy photos. That is one totally glorious dress. Thanks for sharing your sewing journey with us. Pooching? What pooching?! Just wow! The poaching under the bust is so not noticeable until you posted it out. I’m in awe of this dress! Your gown is insane pretty! I have a few fancy dress patterns that I couldn’t resist buying but have never sewn because I have no where to wear them, but it’s so interesting seeing how other people have made super fancy frocks. Congratulations on your labour of love. Thank you for sharing the process and your private pictures. Stunning job and stunning dress. May I wish you both every happiness for your life together. Your dress turned out so gorgeous and you just glow in all the pictures!! 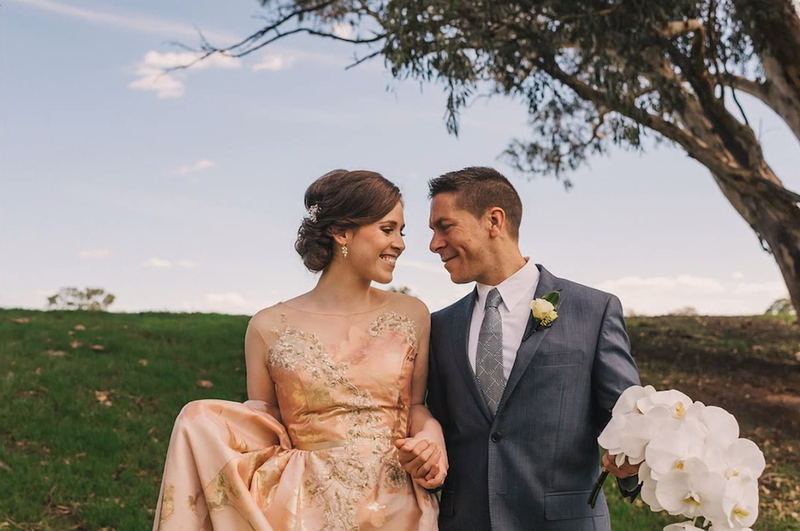 Thank you for bringing us through the journey – I can imagine it was hard to keep your lips sealed during the process :) I’m currently planning my wedding and though I’ve sewn a few things, I can’t imagine tackling the dress – planning is stressful enough! 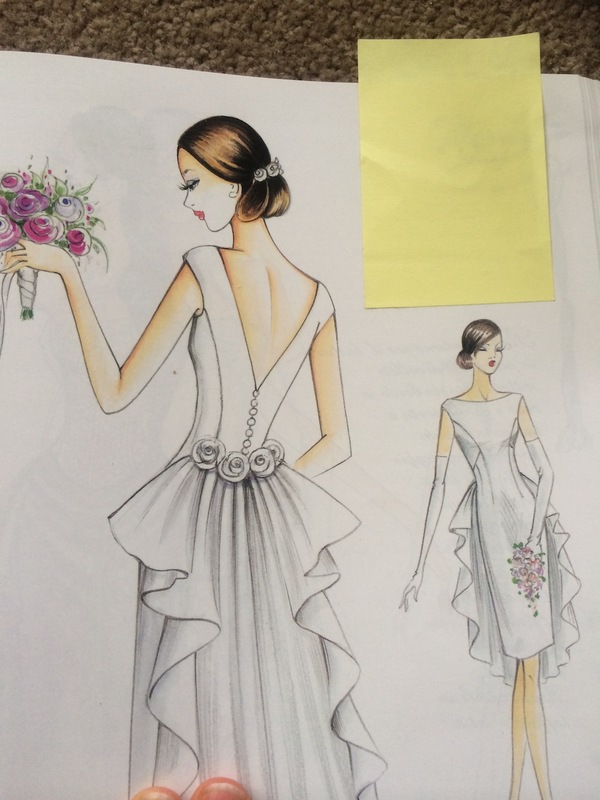 So I’m curious if you could share with us all your wedding dress sewing ‘timeline’? When did you finish it all? Or at least most of it? Did you set deadlines for yourself? Did you leave anything for last minute? To be honest I was so busy being focused on making sure I had a dress to wear on the day I didn’t get to think much about keeping the secret! But thank you, Carrie :) I did absolutely have a sewing plan along the way, with milestones to keep me on track…. 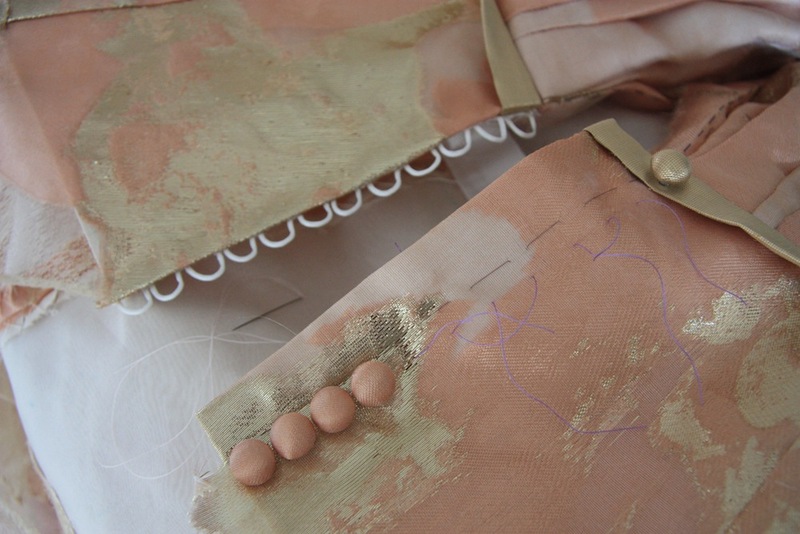 November – First muslin of the skirt and bodice. A lot of running around trying to source silk taffeta, buying notions, researching techniques and just generally thinking a lot about it. 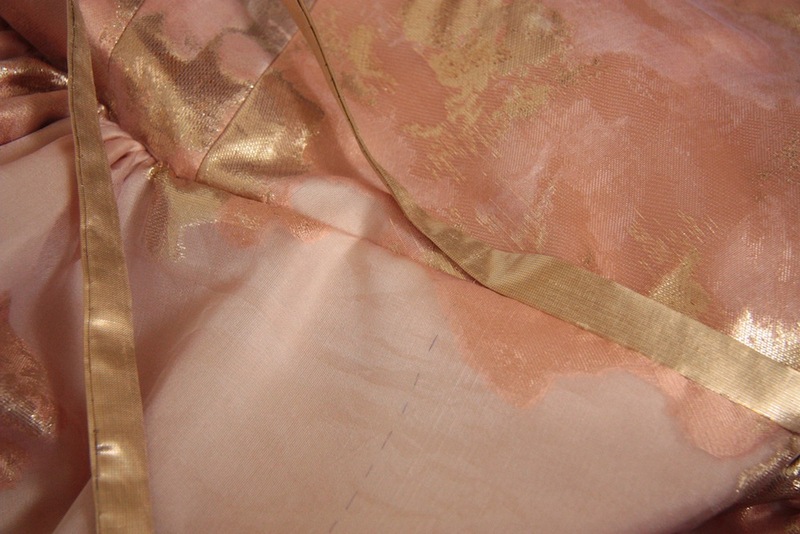 I also prepared muslins for both bridesmaid dresses, and I cut out the pieces for all five silk robes. December – I sewed all 5 robes, finishing those on Boxing Day. I had my first fitting session with my old teacher on the skirt at the beginning of the month, and further refined that before sewing it up in poly taffeta and organza in preparation for my next fitting session in January. I also sewed two bustier muslins for fitting purposes. I also had an initial fitting session with both my bridesmaids. January – I only had two weeks for sewing in January as we spent the other half on the beach in the Philippines, so it was almost a write off. 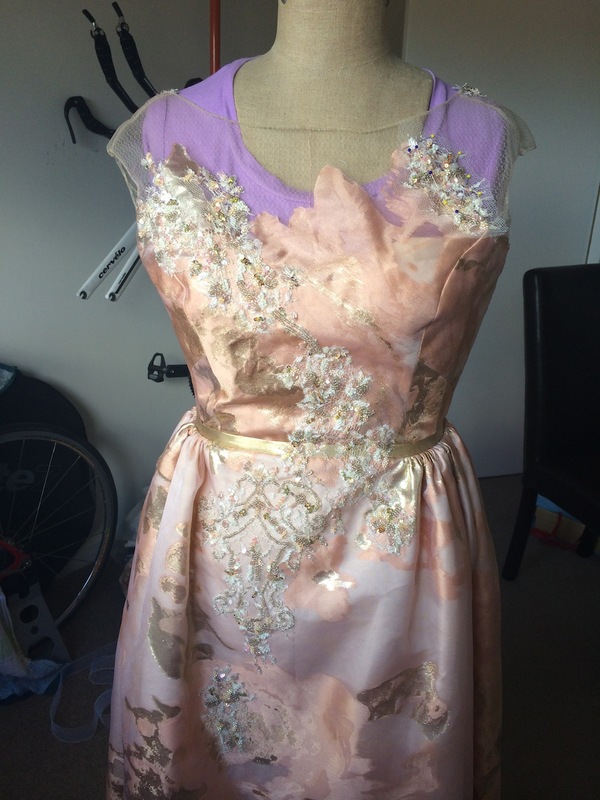 I finished both my bustier dress rehearsal muslin and started my final bustier. I had my second and final fitting session for the skirt and bodice, ending up with the ‘final’ muslin. I also cut out the dark green bridesmaid dress. 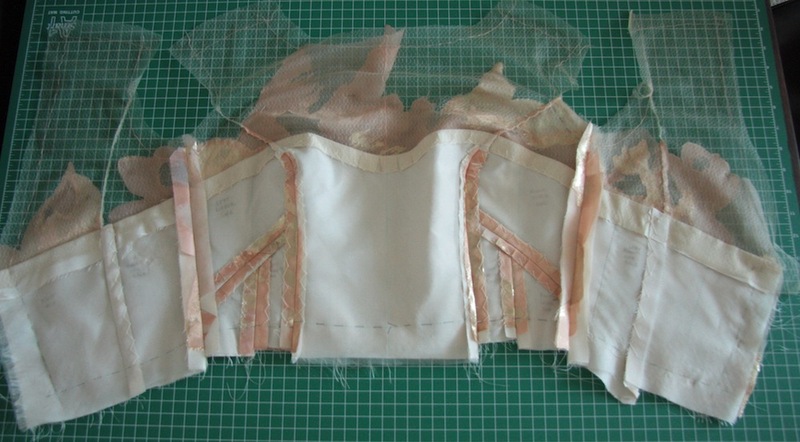 February – I finished the final bustier! 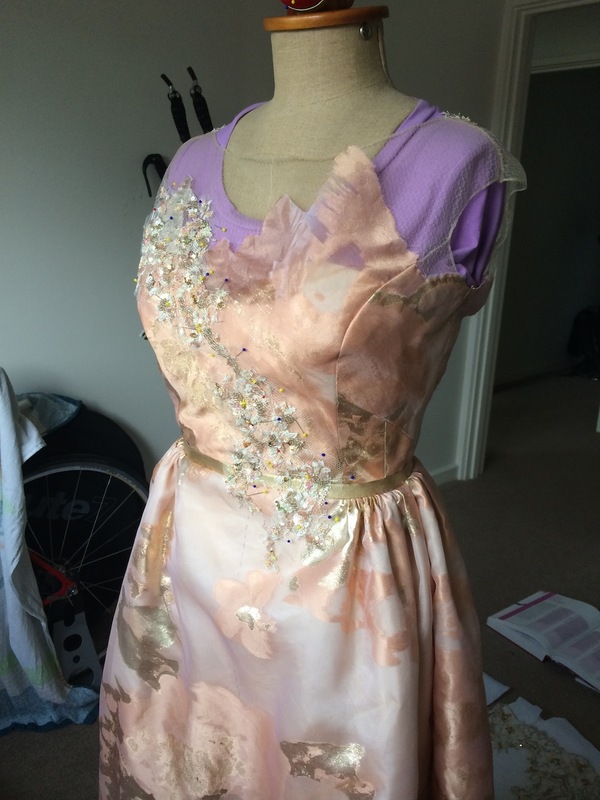 I started working on the dark green bridesmaid dress… which pretty much took me the whole month. February is where I started freaking out/knuckling down, sewing for up to 4 hours each week night and virtually the entire weekend right through until the end. I finished the green dress all bar hemming in just over 3 weeks solid. I cut out the light green dress, and started work on that. April – I spent the first week hemming my dress and sewing on lace, I hemmed both bridesmaid dresses on the 4th, and finished my dress on Tuesday the 8th, and we got married on the following Saturday. Phew! WOW! I am in total awe of the detail and effort you put into this dress. It is truly a princess gown, and it turned out beautifully, you looked lovely in it! I have been checking my emails and stalking your website after your initial post of sewing your gown waiting to see how it turned out. The series of the projects were a wonderful read, thank you for taking us on that journey with you. Congratulations on a wonderful start :) You inspire me on tackling something complicated! Thank you Lee-Ann, I’m about as proud as it gets over it :) You’ll never regret pushing yourself – even if it doesn’t turn out the way you want it too, you learn so much. Wow, I’m more in awe with every post! I can hardly imagine taking on a project like this, so many daunting details in difficult fabrics! You did such a fabulous job. I would be interested in seeing your timeline too… I just can’t really fathom the amount of organization, time-management, and positive attitude that this took! God! This is just so pretty it makes my eyes hurt! Hahaha! I love LOVE LOVE your lace placement, and all your couture methods are just so inspiring. But that fabric… sigh… so truly stunning. and I still can’t get over how wonderfully that fabric compliments you! You look ‘lit from within’ (though I guess some of that could just be that wedding day ‘glow’?) Anyway, such a stunning, stunning dress. Thank you SO much for sharing your process with us – it’s been such an inspiration!! I can’t get over how beautiful your gown is, and of course how beautiful you look in it! The lace is just stunning. Your attention to even the smallest detail is evident in each photo. Congratulations! Beautiful! What a great story! I love that dress. Congratulations. so beautiful and such a great color combination, looks perfect on you. Your dress is absolutely amazing! You did such an amazing job, it’s just as gorgeous (if not more so) than the inspiration. Definitely my favorite handmade wedding gown I’ve seen! Thanks for sharing. I’ve really enjoyed this series of posts, and of course, your dresses absolutely stunning! You are right to be so proud! Beautiful! Thanks for sharing your wedding Dress process. I loved reading it and you did a great Job! Your dress is exquisite – everything!…the fabrics, the colours, the textures, the shape of the dress, all the amazing details and it suits you perfectly. You are a beautiful, beautiful bride and with your super attractive husband you make a wonderful couple. All the best to you in your new life together. You look very well suited. I don’t know if it would be difficult to take out the button loops – they could be dipped in a tea bath to make the colour more to your liking or dyed with some avocado pits! It’s a very small thing but if it bugs you and it would be easy to change, then I’d say – do it. It will make a difference to you. Thanks for your amazing posts about putting this gorgeous creation together. An absolutely wonderful journey. Also the robes you made for yourself and your attendants are beautiful too. Thank you for your lovely words, Barbara :) I probably won’t do anything about it now, now that’s it’s all done with – but I’ll keep that in mind for another time. Someone said they use markers to colour in things like that – another great idea I though! It is so beautiful! I am still in awe over the souffle and how incredible it looks. I had a bit of that pooching on my wedding dress too. I was told by a friend of mine who is an incredibly advanced sewist that it is not a failing on the part of the sewist, or the pattern, but is because we can’t possibly stand with ramrod straight spines all the time. In a garment like a wedding dress, the minute we relax our postures, we’ll get some pooching. 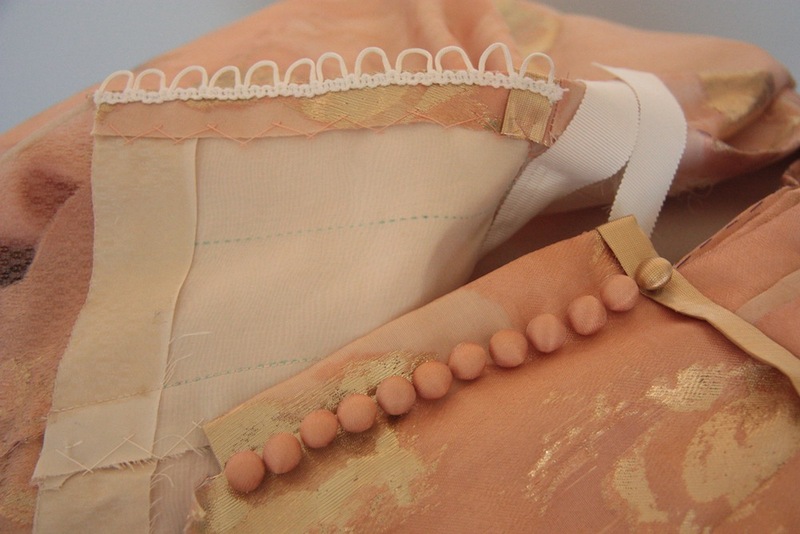 It made sense to me at the time – there is a lot going on in a wedding dress bodice after all. An amazing job, and you look fantastic! Thanks for sharing your journey through the creation of this fabulous dress. I so enjoyed following the progress and the final result is just stunning. I think we sewers are highly critical of our own work and we see all sorts of things we think could be improved. No one else even notices these perceived imperfections but it’s what keeps us striving to improve. If the white button loops bother you try a permanent Sharpie marker. I use them all the time; they come in all colors and are much easier than dying and you can work on a finished garment. Your dress is lovely and I hope you have another opportunity to wear it. haha, thank you. I don’t know about that… my usual dry cleaner refused to clean it because the test he did on a scrap of my lace dissolved some of the beads. So it looks like I’m going to either do it myself at home, or leave it soiled! Argh! 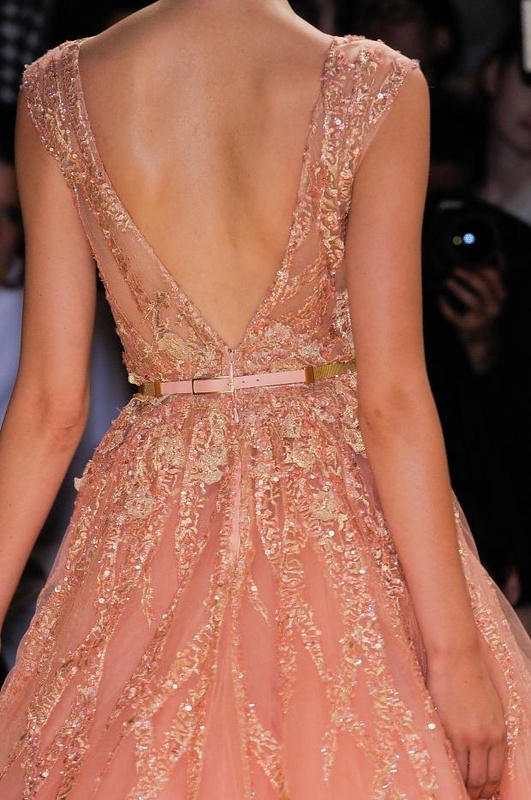 Your dress amazes me more each time I see it showing all the loving details and inspiration. Thank you again for sharing. I think the comment that you glow from the inside out is really true. You glow in all the photos. I thank you for writing such detailed posts about your long journey. It really is appreciated. It is beautiful as is your handiwork. Your wedding dress is such an awe inspiring creation. 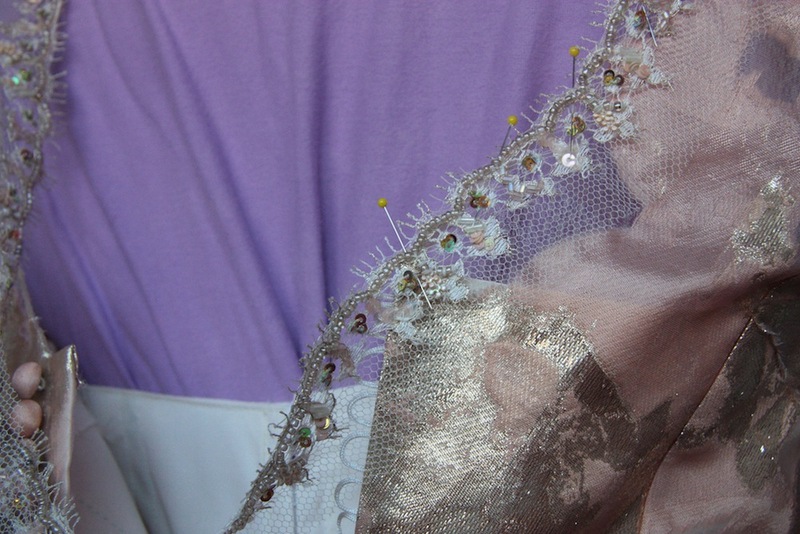 The amount of detail, the time and effort you have put into sewing it are a real credit to your skill and perseverance. You are glowing in all your Wedding photos…absolutely stunning. I am at the planning stage for my own wedding dress, but you have set the bar extremely high. Mine won’t be nearly as exquisite as yours, but I hope I will enjoy the process and be as happy with the result as you have been. Oh my! Your dress is just beautiful! You must be so proud, congratulations. Your wedding pics are gorgeous too. So beautiful. The pooching (which wasn’t noticeable until you pointed it out) is just one of those perfect imperfections! oh i used invisible thread once, that stuff is horrid to work with! i know there is superfine thread used in shirtmaking, wonder if that would have worked for you. at any rate, you did fabulous with what you had, i can’t see a single stitch! the lacework is just gorgeous. i especially love how it comes down the front over the waistline. as far as the “pooching” i wonder if light boning would have been enough to fix it. personally, i think it looks charming and i hadn’t really noticed until you mentioned it! i totally understand those nagging thoughts though. when i made my sister’s wedding dress two years ago i made a huge error in the skirt draft (i had no conception of how a train is drafted…) and i still think about it! nobody would notice the problem unless they knew something about grain lines, but i still cringe at the thought! anyways, thank you for sharing the process of making your dress, it was truly inspiring! OH MY GAH, THAT KATE ERMILIO DRESS!!!!!!!!!!!!! OK, swoon over. Your dress turned out beyond beautiful, and the little doubts you have about it would never be noticed by anyone else! I’m so impressed by your work and so glad you shared the whole process on your blog! 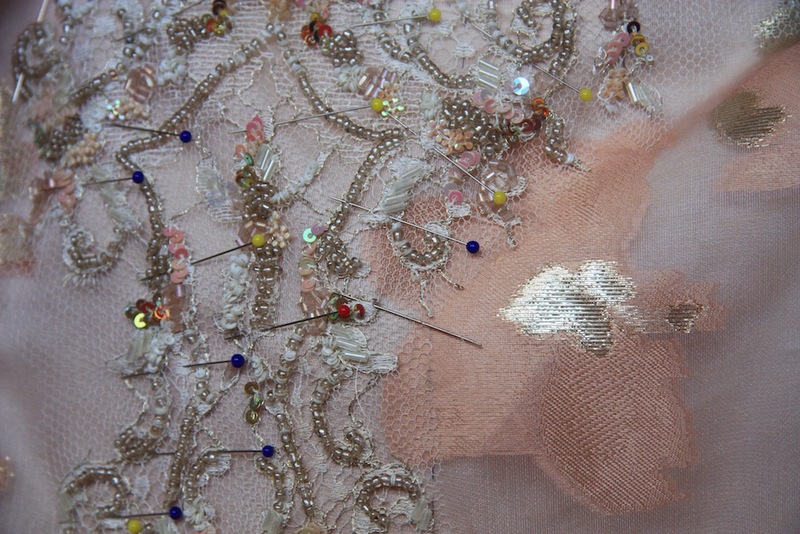 I have just loved reading about the making of this gorgeous dress! What a project – you must be so, so proud of what you created! Your dress will be part of your wedding memories forever – it seems like the dress is as happy as you look wearing it! I absolutely am :) Thank you so much, Karen! Thank you so much for sharing with us. Not only your beautiful needlework but your fabulous taste!! I got married in jeans – no white dress has ever really appealed to me – but THAT dress! Yowza. That glowing peach. SO GORGEOUS. Wow – I really want this all in video form – I would sit and watch in fascination how it all came together. But perhaps I am just greedy for details!! 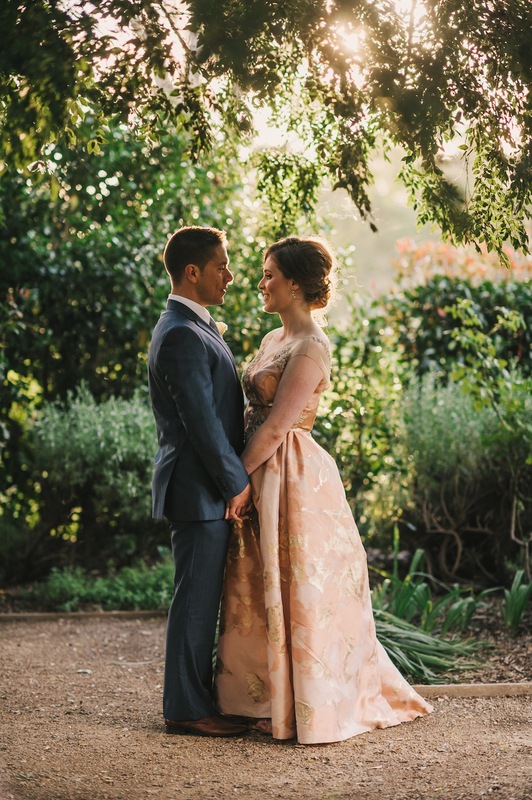 The gold belt came together as an idea at the last minute thanks to the help of a wonderful fabric shop assistant who knew her stock and was able to send it interstate for me – and I’m so glad I decided the dress needed it! haha, thanks Amy :) Time for a G&T, methinks. The dress is gorgeous. You are gorgeous! Thanks so much for sharing all of this. The way your creative vision came to life for your wedding day is just spectacular! Amazing! I said it before but it’s still beautiful. 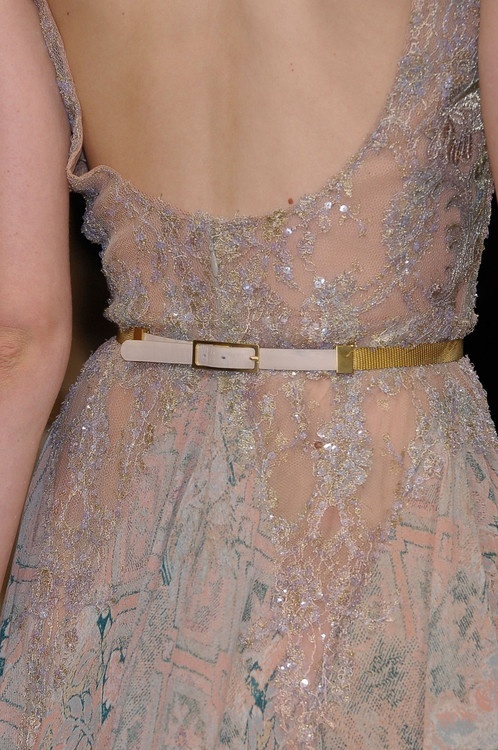 I really like the sheer section, and the lace edging on the back neckline, and the gold belt is a really nice addition. Absolutely gorgeous!!!!! You created the gown of your dreams like no one else could do. I, to, created my wedding gown 10 yrs ago….what satisfaction this accomplishment brings! Blessings upon your marriage…..thanks so much for sharing!!!!! I love to see you used a Marfy pattern. 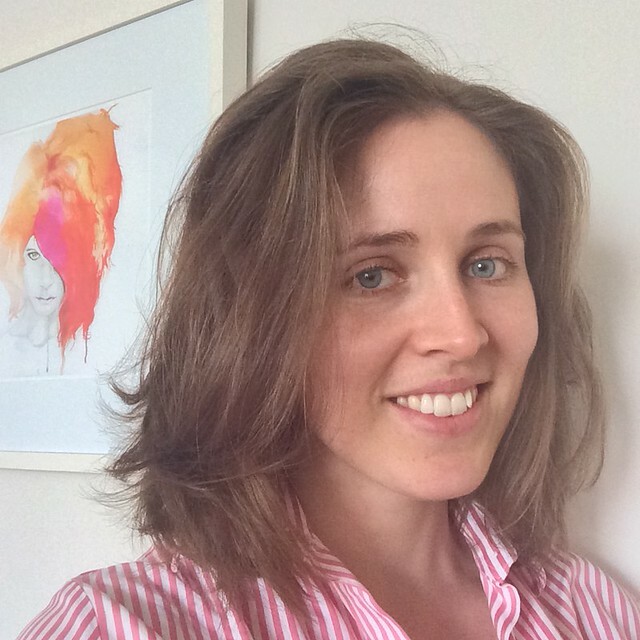 Did you know Alessia from Marfy, Ferrara, Italy, home exchanged here in Perth several years ago? and she has recently been home exchanging in Qld?